Writers: James Kennaway, Wilfred Greatorex, Derek Dempster, Derek Wood. Set in 1940, the film tells the tale of the epic battle of Britain. Nazi Germany is attacking the airfields of the south east as part of Operation Sea Lion, and in order to stop the enemy from achieving their goals for invasion, the British Royal Air force must fight a desperate battle for control of the skies. With death defying aerial acrobatics, this historical re-enactment takes the audience to the heart of World War II. With the Luftwaffe advancing onto London, the RAF must gather their destroyed resources and launch a critical attack. Starring Michael Caine (The Dark Knight, The Italian Job), this feature was not to be his last visit to the county: the actor returned in Is Anybody There? , the touching story of the friendship between a young boy and a retired magician, which was filmed in Folkestone and Hythe. The Battle of Britain featured some of the best of Kent’s locations. The village of Chilham became the base of operations for the radio controllers in the film. A popular filming location in the county, Chilham is most famous for appearing in Agatha Christie adaptations. Miss Marple: The Moving Finger was filmed almost entirely in the village and it was also home for a special Christmas episode of Poirot. Another Kent Village, Denton, appeared in the film. The local pub, The Jackdaw Inn, had a cameo as the scene for Christopher Plummer (The Sound of Music) and his on-screen wife, giving the audience an insight into the personal effects of war. The Jackdaw Inn has a room devoted to RAF World War II memorabilia and is a must see for any history buff. RAF Hawkinge was the obvious choice as a location for the film. With a rich military history, the site is now a museum with the largest collection of Battle of Britain artefacts on show in the country. 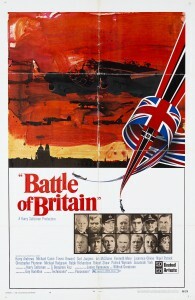 The Battle of Britain was released in 1969 and is now available to buy on DVD. This entry was posted in Filmed in Kent and tagged Battle of Britain film locations, Chilham, Denton, feature film, Guy Hamilton, Michael Caine, RAF Hawkinge, The Jackdaw Inn, Trevor Howard. Bookmark the permalink.